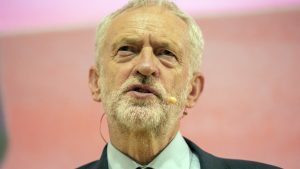 The so-called “wreath row” surrounding Jeremy Corbyn has taken many twists and turns since photos of the Labour leader at a 2014 event in Tunisia came to light on Saturday. 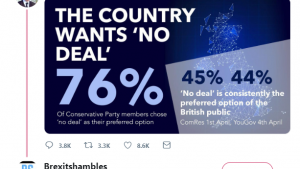 It’s emerged today that the party has complained to the press regulator IPSO about how some newspapers have reported the story. 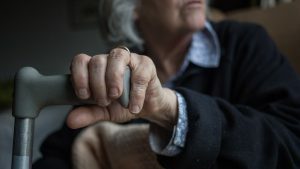 The controversy centres on one key question: did Jeremy Corbyn lay a wreath on the graves of individuals linked to the Black September terror group and the Munich massacre of 1972? The photos are from the Facebook page linked to the Palestinian Embassy in Tunisia. The Mail’s story includes a response from Labour sources. They insist Jeremy Corbyn was at the service to commemorate the Palestinians who were killed in an Israeli airstrike in 1985. On 1 October 1985, Israeli forces attacked the Palestine Liberation Organisation (PLO) in Hammam Chott, a suburb of the Tunisian capital, Tunis. At least 47 people were killed in the bombing. The attack was widely condemned, including by the United States. Labour’s account seems consistent with the Facebook caption from the Palestinian Embassy. That raises the question of who the “others killed by Mossad agents in Paris in 1991” are. Mr Corbyn’s language could suggest that part of the trip to the cemetery commemorated individuals linked to Black September. Here’s why. Atef Bseiso was head of intelligence for the Palestine Liberation Organisation, and was believed by Israel to have been behind the Black September attack on the Munich Olympics. Bseiso was killed outside a Paris hotel in 1992. The PLO claimed he was assassinated by Israeli secret services, but Israeli authorities said it was the work of a rival Palestinian faction. Another senior PLO figure, Salah Khalaf, was killed in Tunis in 1991. The United States and Israel accused Khalaf of having founded the Black September group, which he denied. Both men are buried alongside two others who were killed in Tunis in 1991 in the cemetery that Mr Corbyn was visiting. 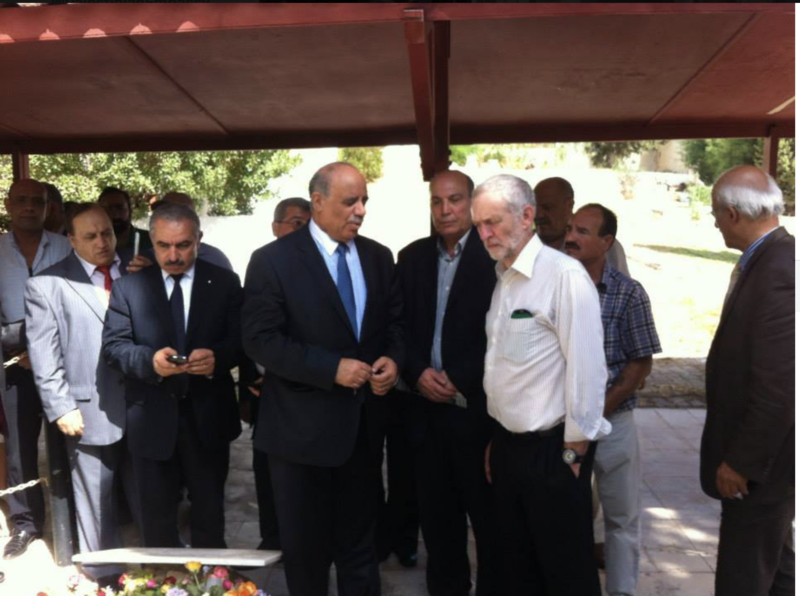 Many commentators have suggested that Mr Corbyn was referring to these individuals when he wrote about a wreath being laid on the graves of “others killed by Mossad agents in Paris in 1991.” The pictures from 2014 of Mr Corbyn holding a wreath in the cemetery show him stood a few feet from those graves. It’s worth noting that Mr Corbyn’s exact words in the Morning Star article – “wreaths were laid” – don’t specify who actually laid the wreaths. 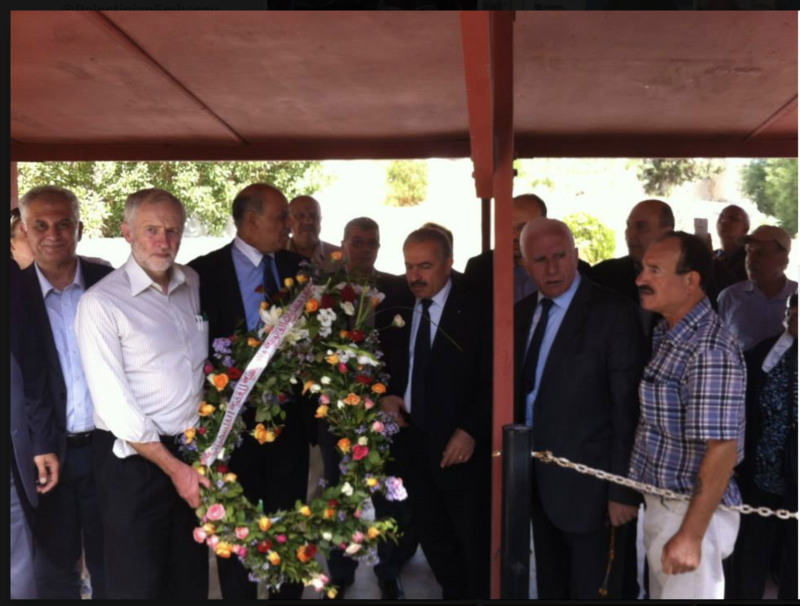 There is at least one photo of Mr Corbyn holding a wreath, which according to the Daily Mail story, shows Mr Corbyn stood very near to the graves of those linked to Black September. This echoes the language in the 2014 Morning Star article – it doesn’t specify who laid a wreath, nor does it quite clarify who was killed in Paris. We don’t know in what order these photos were taken. The final image appears to show the same wreath resting underneath the plaque. Channel 4 News spoke to Mr Corbyn on 14 August 2018. Is Mr Corbyn referring to Salah Khalaf? [We made clear that, if he is, when Mr Corbyn describes laying a wreath “in memory of all those who died”, he must be talking about Khalaf]. Does Mr Corbyn believe that Salah Khalaf was “not involved with anything to do with” the Munich massacre or Black September? “As we have consistently pointed out, Jeremy laid a wreath in memory of the dozens of Palestinians and Tunisians, including civilians, killed by an Israeli air attack on the PLO headquarters in Tunisia on 1 October 1985, an act that was condemned at the time by the UN and Margaret Thatcher’s Conservative government. This is an annual ceremony which is held by Palestinians and Tunisians to mourn the dead in that attack. “The interviewer would have been left in no doubt that Jeremy was talking about laying a wreath for the people who were killed in the illegal 1985 air strike. “Among those who are buried there are a number of senior former PLO leaders. They include Salah Khalaf, who was Yasser Arafat’s number 2 in the leadership of Fatah and the PLO in the 1970s and 1980s, and was assassinated in Tunis in 1991, and Atef Bseiso, a PLO intelligence chief who was assassinated in Paris in 1992. “Both have been accused by Israel of having had links with Black September in the early 1970s, though they always denied it, as has the PLO. 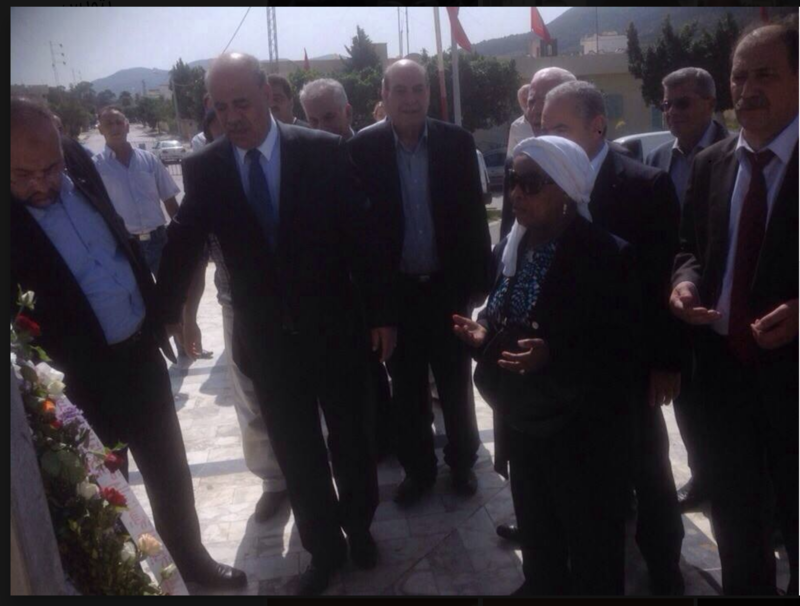 Both were senior Fatah and PLO leaders of the time, and Palestinian officials continue to pay respects to them. 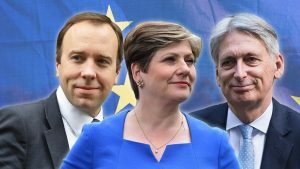 But Jeremy did not lay wreaths on their graves. 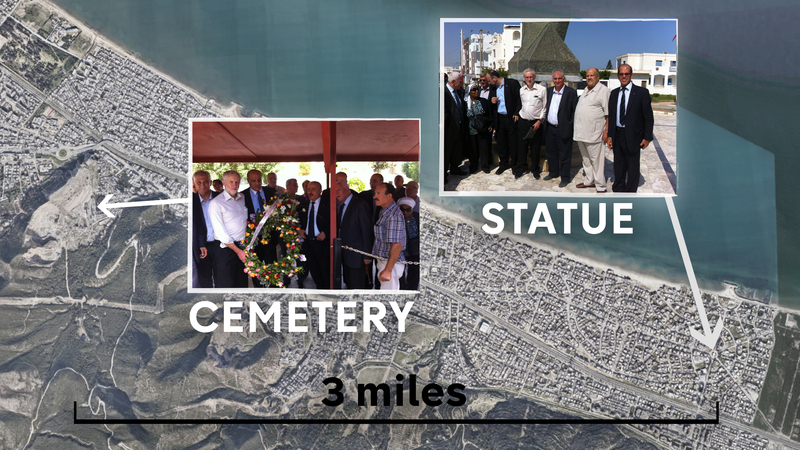 The town Mr Corbyn was visiting, a southern suburb of the capital Tunis called Hammam Chott, actually contains two memorial sites for the victims of the 1985 Israeli attack on Tunisia: a large monument on the seafront, and a memorial plaque in the Palestinian Cemetery three miles away. The monument near the seafront has a distinctive lower section. 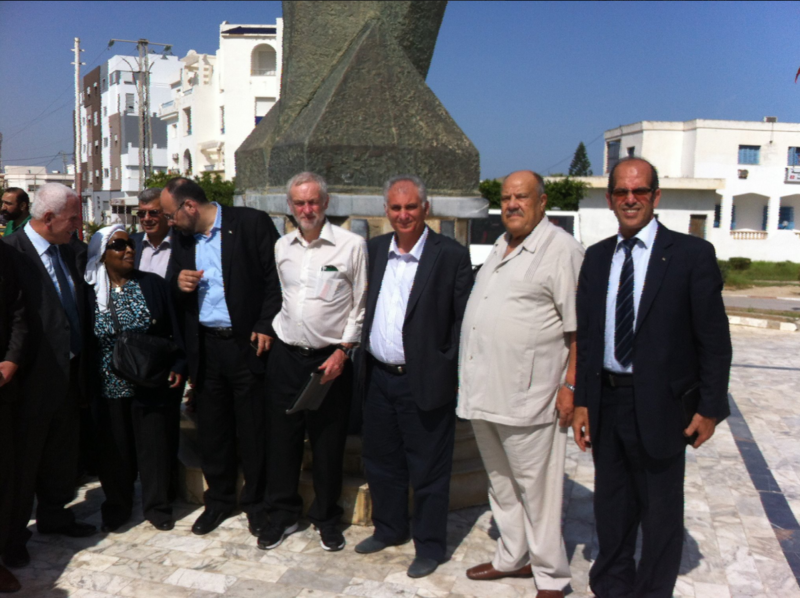 We know Mr Corbyn visited this monument because the photos from the Palestinian Embassy in Tunisia, show him and other delegates gathered around that distinctive lower portion. We can also see from the same set of pictures that a wreath was laid at that monument. 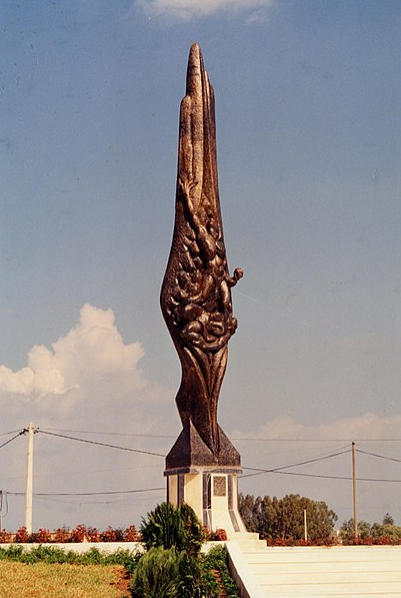 But we have seen no photographic evidence that Mr Corbyn himself laid a wreath at this large seafront monument commemorating the 1985 bombing. 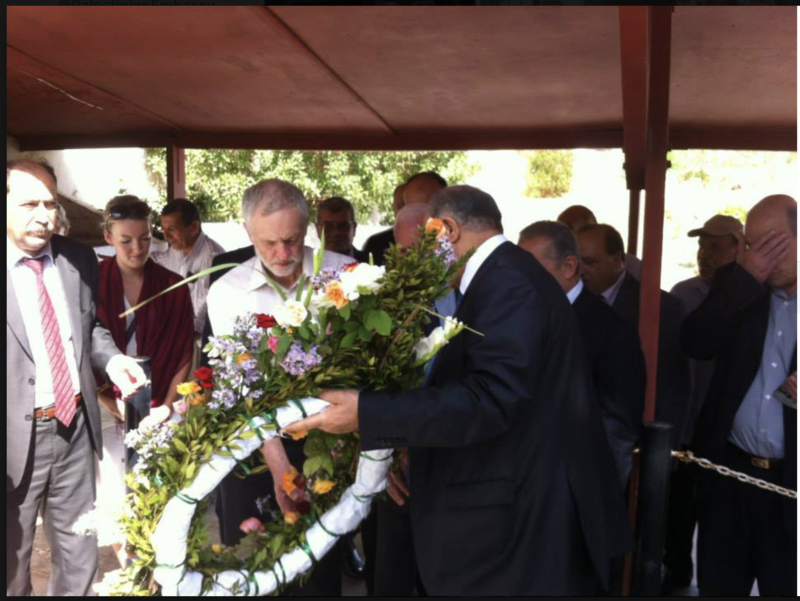 The only image we have of Mr Corbyn holding any wreath is when he was at the Cemetery for Palestinian Martyrs. That Cemetery contains the town’s other memorial to the 1985 victims – the memorial plaque. But the only photos of him holding a wreath in the Cemetery show him – according to the Daily Mail’s report – 15 yards away from that plaque. The same photos place him just a few feet in front of the graves of people linked to the Black September terror group. In 2014, Jeremy Corbyn was pictured holding a wreath in front of a plaque commemorating three Palestinians – including Salah Khalaf, who Israel says was linked to the 1972 Munich massacre. Labour sources said Mr Corbyn was there to commemorate the victims of a different attack: the 1985 bombing by Israel of the Palestine Liberation Organisation in Tunisia. The bombing was widely condemned at the time, including by the US government. In a later interview, Mr Corbyn said that he did lay “a wreath in memory of all those who have died”. According to a Daily Mail reporter who visited the cemetery, the available photos of Mr Corbyn holding a wreath show him 15 yards away from the memorial plaque for the 1985 victims – but directly in front of the plaque for Salah Khalaf and others. Speaking to Channel 4 News on Tuesday, Mr Corbyn’s language seemed to suggest that Salah Khalaf was amongst those for whom he laid a memorial wreath. Salah Khalaf denied that he was a founder of Black September.